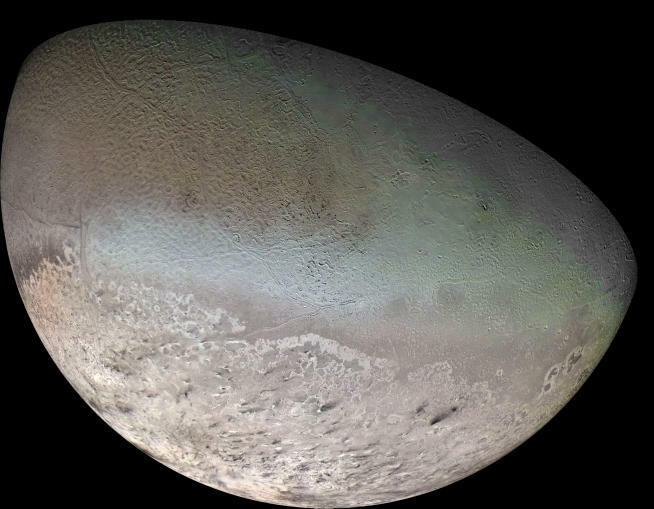 like Gliese 623 A (M2.5V) and B (M5.8Ve) at lower right. AU Microscopii (Mic) is now thought to be gravitionally bound to the relatively distant dim binary system of AT Mic AB (NStar Database; and Monsignori Fossi et al, 1995), located around 1.2 light-years (ly) away. The triple system is located around 32.4 ly from our Sun, Sol, in the northwest corner (AU Mic - 20:45:9.5-31:20:27.2 and AT Mic AB 20:41:51.2-32:26:6.8 ICRS 2000.0) of Constellation Microscopium, the Microscope -- northwest of Alpha Microscopii, southwest of Omega Capricorni, south of Dabih (Beta1,2 Capricorni), and east of Ascella (Zeta Sagittarii). 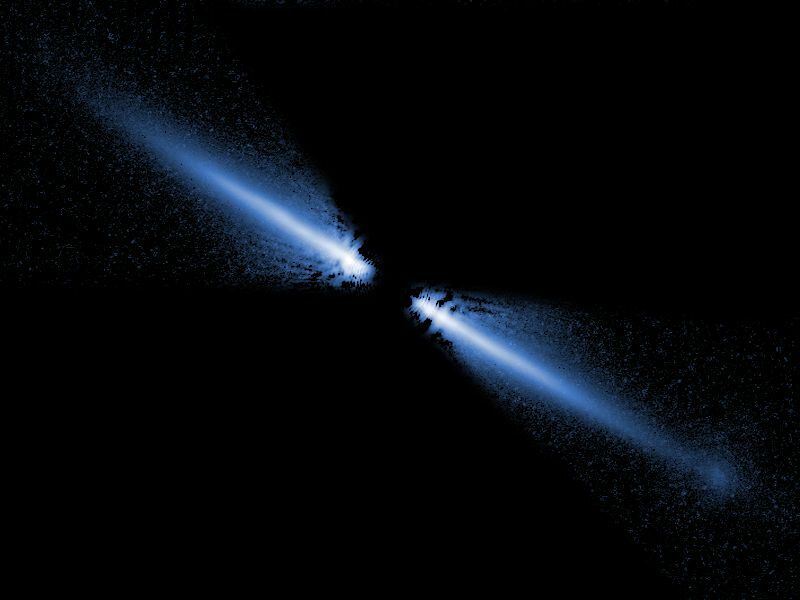 However, all three stars are too faint to be seen with the naked eye and are around the same age as Beta Pictoris, belonging to 20 young stars now identified as being members of the Beta Pictoris moving group located around 10 to 50 parsecs (33 to 163 ly) of Sol (Krist et al, 2004; Paul Kalas; Ortega et al, 2002; and Zuckerman et al, 2001). 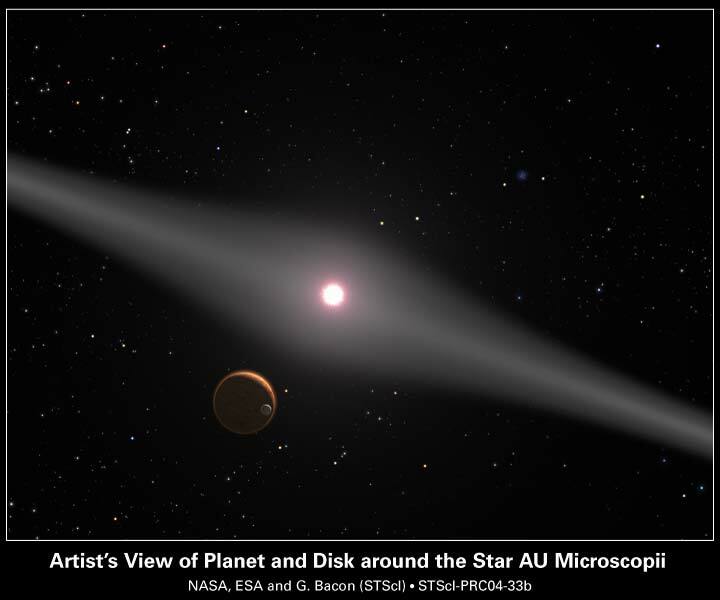 On February 26, 2004, astronomers announced evidence for a planet around AU Mic based on the discovery of a hole in the star's circumstellar dust disk (physicsweb article; and IFA press release). 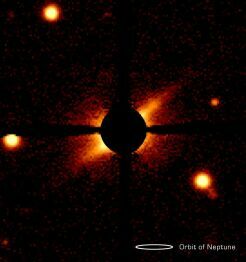 On August 12, 2004, the same astronomer team announced indirect detections of a planetary system (IfA's press release). 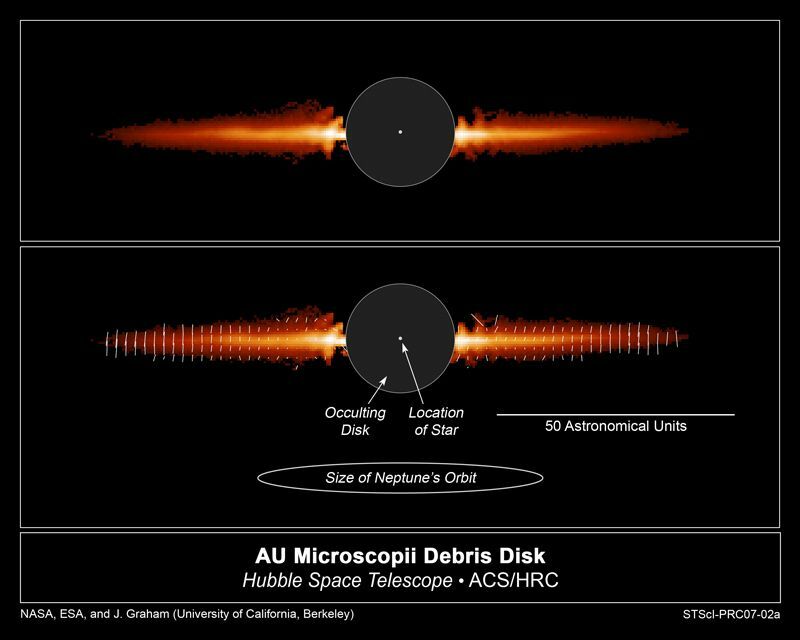 On January 7, 2007, astronomers using the Hubble Space Telescope announced that the observation of "a blizzard of particles" in AU Mic's disk which reveals the process by which planets grow from tiny dust grains (new release -- more below). On May 7, 2007, astronomers modelling the vertical thickness and dust production in AU Mic's disk based on Hubble observations submitted a paper arguing that its disk likely contains planetary embryos as large as Pluto that are undergoing runaway growth into larger bodies (Quillen et al, 2007 -- more below). This cool and dim, main sequence red dwarf (M0-1 Ve) has only around 50 percent of Sol's mass (Paul Kalas), around 66 to 67 percent of its diameter (Johnson and Wright, 1983, page 697), and about 2.5 to 2.9 percent of its visual luminosity but an absolute luminosity (including infrared wavelengths) around 10 percent of Sol's (Paul Kalas). However, AU Microscopii is a very young, active flare star, only around 12 million years old -- but may be as young as eight and as old as 20 million years old. In addition, it is also classified as a BY Draconis variable due to prominent starspots and a fast rotation. Some alternative names and useful star catalogue numbers are: AU Mic, Gl 803, Hip 102409, HD 197481, CD-31 17815, CP(D)-31 6335, SAO 212402, LTT 8214, LDS 720 A, and V 824. AUs of the star (more). In the 1980s, the Infrared Astronomical Satellite (IRAS) revealed an "excess" of far-infrared radiation in the spectrum of AU Mic. Infrared excesses around stars are common (around 15 percent of all stars), but direct images are quite rare -- obtained in barely a handful of cases thus far. Some strong detections of an infrared excess have been found later to be associated with substantial dust disks around some very young star systems such as Beta Pictoris; indeed, AU Mic is likely to have been born from the same nebula as the more massive Beta Pic, an A-type star, which has three to four times more dust than AU Mic in its disk. 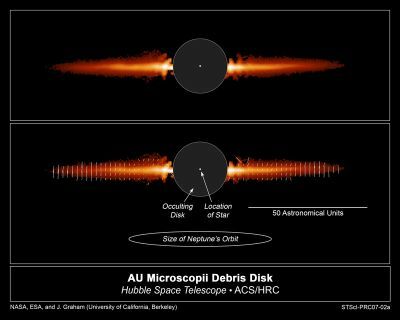 In the case of AU Mic, a dust disk was later imaged as a nebulosity around the star using a charged-coupled device (CCD) at the University of Hawaii 2.2 m telescope on Mauna Kea by a team astronomers, including Paul Kalas as the lead investigator (Kalas et al, March 2004; in pdf). 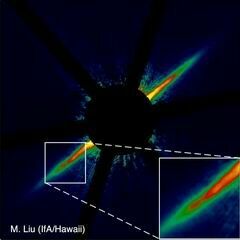 In 2004, a similar team of astronomers (including Michael Liu, as lead investigator, Kalas, Jonathan Williams, and Barbara Matthews) made a new measurement of the infrared excess around AU Mic using the James Clerk Maxwell Telescope (JCMT) on Mauna Kea. According to Kalas, the data indicated that the star is surrounded by dust of a given temperature, and that temperature suggests how far away from the star the dust is located (i.e., closer is hotter). 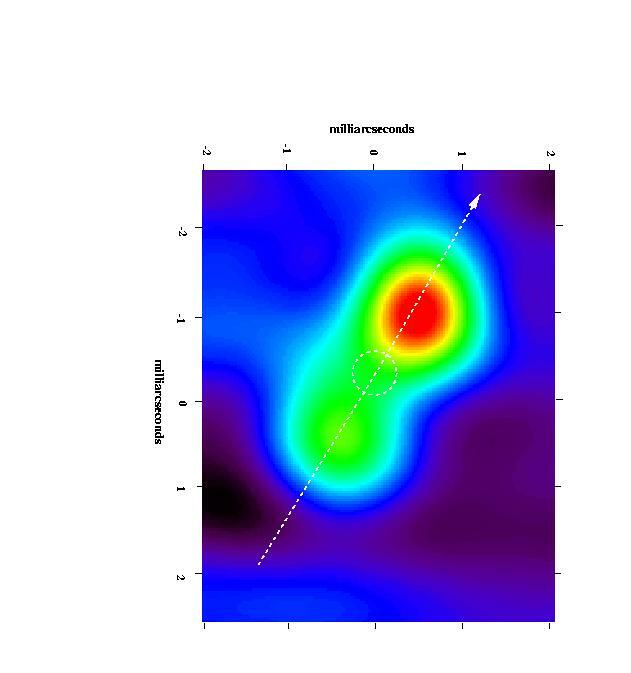 In the case of AU Mic, the team found that the dust is quite cold (40 Kelvin), and the lack of hot grains in infrared emission indicates that dust is missing within 17 AUs of AU Mic -- which was confirmed optically within 12 AUs (Krist et al, 2004). The disk extends around 35 to more than 100 AUs from the star (Krist et al, 2004; and Michael Liu, 2004). cleared out by a planet(s) (more). Infrared images of AU Mic's disk were obtained by blocking out the glare of the star using a device known as a coronagraph. Although the earlier CCD image indicated that the dust around AU Mic is contained in a circumstellar disk, the occulting spot for the star that made those images possible has a radius of 50 AUs and so the 17-AU hole in AU Mic's disk could not be seen directly; subsequently, however, the Hubble Space Telescope was used to resolve the disk to within 8 AUs of the star. Astronomers have interpreted the data as indicating that there is dust depletion within 12 AUs of the star, and that one way to keep grains away from the star is if a planet is sweeping up the dust (Krist et al, 2004; Kalas et al, 2004; and Liu et al, Astrophysical Journal, forthcoming June 2004). 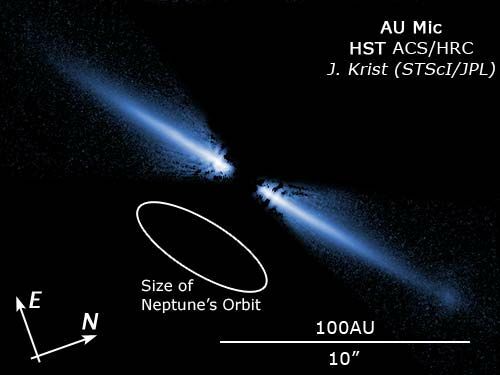 On August 12, 2004, the same astronomer team announced that they had found multiple clumps in the dust disk about 25 to 40 AUs from AU Mic (between the orbital distances of Neptune and Pluto in the Solar System) which are probably produced by the gravitational interactions of unseen, newly formed planets. According to the team's calculations of asymmetries in the inner disk that exhibit a sharp change at around 35 AUs (32-38 AUs) of the star, these planetary bodies could be as small as Pluto. However, they are likely to be smaller than Jupiter as very massive planets should still retain sufficient heat from planetary formation to have been directly visible with the Keck telescope(s) used by the astronomers (more from IfA's press release, Michael Liu, 2004, space.com, and Science -- requires subscription). On January 7, 2007, astronomers using the Hubble Space Telescope announced that the observation of "a blizzard of particles" that they believe to have been shed from unseen snowball-sized objects in AU Mic's disk, which reflects the process by which planets grow from tiny dust grains (new release). The icy as well as dusty snowballs are believed to reside in a region called AU Mic's "birth ring," which was first hypothesized in 2005 by Linda Strubbe and Eugene Chiang. Located between 3.7 and 4.6 billion miles from the star in an icy cold region of AU Mic, these objects bump into each other and release fluffy particles that are propelled outward by the intense pressure from starlight. 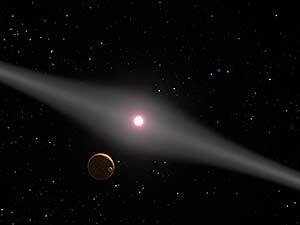 Many astronomers believe that such objects are the seeds of planets that have or will eventually develop. On May 7, 2007, astronomers modelling the vertical thickness and dust production in AU Mic's disk based on Hubble observations submitted a paper arguing that its disk likely contains planetary embryos as large as Pluto that are undergoing runaway growth into larger bodies (Quillen et al, 2007). Their model predicts how large the planetary bodies in a dust or debris disk must be to puff it up to a certain thickness. 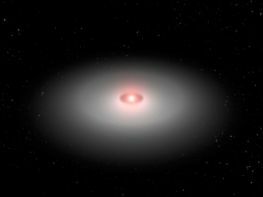 Although a developing star system's dust disk should thin as the system ages, more dust grains may be "knocked" into eccentric orbits that "puff out" the disk if dust agglomeration has proceeded enough for planetesimals to form increasingly large embryonic planets. In the case of AU Mic, the model indicates that a Pluto-sized object may have already formed at an orbital distance of around 30 AUs from the red dwarf star. The distance from AU Microscopii where an Earth-type planet would be comfortable with liquid water may be centered around 0.3 AU. Even if Earth-type life managed to develop on an inner planet within this very young system (which has an estimated age of only eight to 20 million years), AU Mic's frequent flares would "fry" any surface microbes that are not already affected by frequent asteroidal or cometary impactors. This cool and dim, main sequence red dwarf (M4.5 Vpe) probably has less than half of Sol's mass, 41 percent of its smaller diameter (Johnson and Wright, 1983, page 697), and only around 0.35 percent of its brightness. 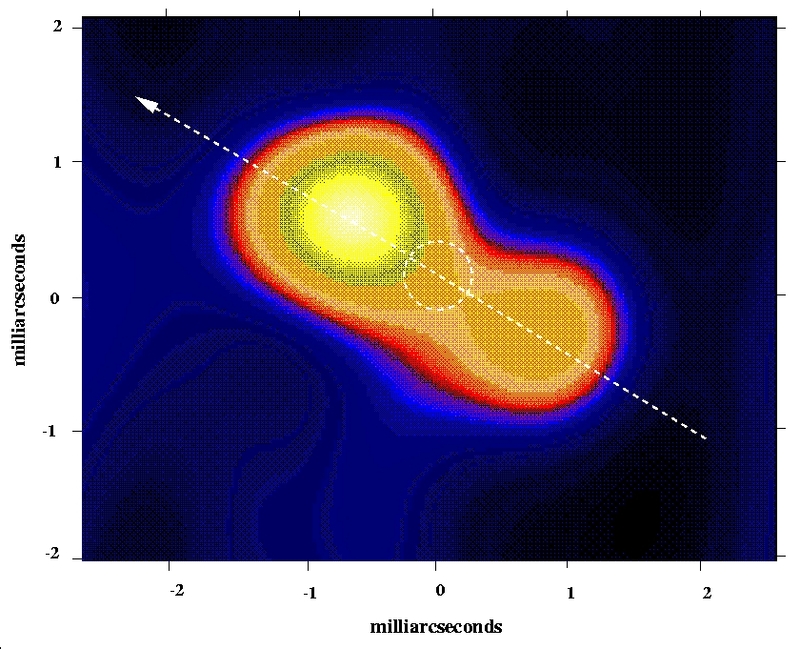 However, AT Microscopii is a flare star, probably around 12 million years old like AU Mic. Some alternative names and useful star catalogue numbers are: AT Mic A, Gl 799 A, Hip 102141, HD 196982, CD-31 16135 A, CP(D)-31 6181, SAO 212355, LTT 8181, LDS 720 B, and U or UGP 502. Star A has a binary companion. In 1962, it was separated from its companion star by almost 40 AUs (SepAB= 3.9"). According to the Sixth Catalog of Orbits of Visual Binaries, the latest data indicate that the orbit of the two stars Stars A and B has an average separation (semi-major axis of 3.18") of 32.5 AUs. However, the eccentricity of the orbit (e= 0.256) moves the stars as close as 24.2 AUs but as far apart as 40.8 AUs. The two stars take around 209 years to complete an orbit around each other, which is inclined by about 137 degrees from the perspective of an observer on Earth (Hartkopf and Mason, 2003). This cool and dim, main sequence red dwarf (around M4.5 Ve) probably has less than half of Sol's mass, 37 percent of its diameter (Johnson and Wright, 1983, page 697), and less than 0.35 percent of its brightness of its brightness. However, it is probably around 12 million years old like AU Mic. Some alternative names and useful star catalogue numbers are: AT Mic B, Gl 799 B, CD-31 16135 B, CP(D)-31 6181 B, and LDS 720 C.
The following star systems are located within 10 ly of AU Microscopii. Up-to-date technical summaries on this system can be found at: the Astronomiches Rechen-Institut at Heidelberg's ARICNS page for AU Mic and AU Mic A and AU Mic B, and the Nearby Stars Database. Additional information may be available at Roger Wilcox's Internet Stellar Database. Celebrating the scientific instrument, Microscopium is one of the 15 constellations created by the Abb� [Abbot] Nicholas Louis de La Caille (1713-1762), who became the first astronomer to systematically observe the entire night sky after studying the stars of the southern hemisphere from 1750 to 1754 at the Cape of Good Hope, the southernmost point of Africa, with just an half-inch (8x) refractor. For more information on the stars and other objects in the constellation, go to Christine Kronberg's Microscopium. For an illustration, see David Haworth's Microscopium. Note: Special thanks to Ralph Pichie for notifying us of updated dust disk findings.